In 2014, Ontario Court Justice Gethin Edward made a groundbreaking ruling in a case having to do with Aboriginal rights and Indigenous medicine. 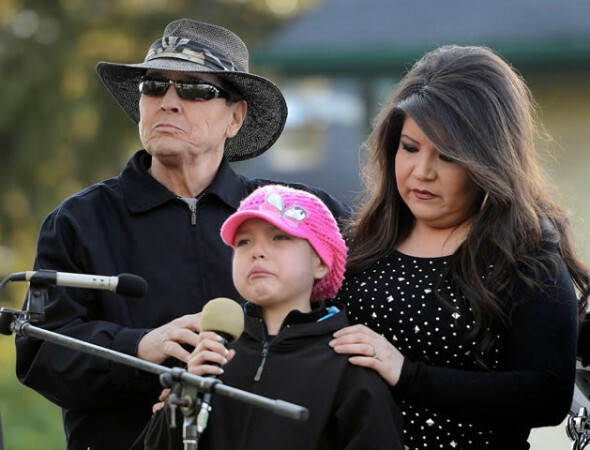 The case before him concerned J.J., an 11 year old Six Nations girl raised in a traditional Longhouse family, who had recently been diagnosed with acute lymphoblastic leukemia, a form of cancer in the bone marrow. 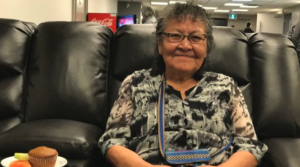 After suffering life threatening reactions to the chemotherapy, J.J.’s mother suspended the treatment program in favour of alternative health and Indigenous healing modalities. Because the Hamilton hospital that had diagnosed her condition deemed that the survival rate for those with this cancer who did not use chemotherapy was effectively zero, the hospital sought to have child services apprehend J.J. from her family and force her into chemotherapy treatment. 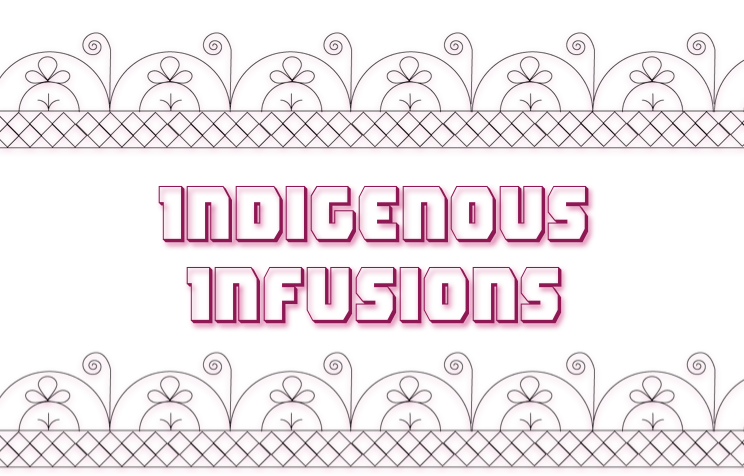 The case came on the heels of a previous controversy as Makayla Sault from New Credit (an Indigenous community adjacent to Six Nations) made international headlines when her family took her off of chemotherapy and sought alternative methods of treatment. In both Makayla and J.J.’s case, community members rallied around the families and indicated that they would physically resist any attempt by outside authorities to apprehend the children and force them into chemotherapy. In Makayla’s case, community members formed a “Makayla defence force” which vowed to physically stop any attempt at removing the girl from her loving family. Justice Edward ultimately refused the hospital’s attempt to apprehend J.J. He ruled that the mother’s “decision to pursue traditional medicine for her daughter J.J. is her Aboriginal right.” He also added that this Aboriginal right held even if Western medical science didn’t approve of the methods used, or even if “objectively” speaking, the Indigenous medicine didn’t work. Justice Edward’s ruling – which was informed by expert evidence from Six Nations Professor Dawn Martin Hill and saw the introduction of evidence from the Haudenosaunee creation stories and the submission of documents like the Haudenosaunee Code of Behavior for Traditional Medicine Healers – vindicated the Haudenosaunee view of the relationship between Native and non-Native society as separate, mutually independent worlds that continue to exist in the present time. According to the Two Row Wampum, the foundational conceptual relationship between Haudenosaunee and Europeans, each party shall travel down the river of life within their two separate vessels according to the principles of “peace, friendship and respect.” In this framework, the two separate systems keep all of their own habits, customs, laws, and medicines within their own vessel and neither interferes in the other’s boat. The interaction between cultures is for mutual benefit, but one either lives in the “canoe” or the “ship. To have a foot in each vessel is a recipe for falling into the river – to be outside of the protection of both systems. Justice Edward’s decision effectively recognized the distinctiveness of the Haudenosaunee way of life and view of medicine, and at the most fundamental level, respected the right of Indigenous people to seek medical treatment and to make life or death choices free of compulsion by the Canadian system. Not surprisingly, Edward’s ruling was highly controversial to those unaware of the nature of this treaty relationship and the willingness of Onkwehon:we people to physically stop the medical system from kidnapping and forcing their children into chemotherapy. 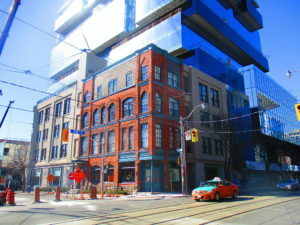 A Globe and Mail editorial attacked the decision because Makayla and J.J. both attended what it characterized as a “dubious, unlicensed ‘health institute’ that claims it can cure cancer through vitamin IV drips, massage, cold laser therapy and the consumption of wheatgrass juice and puréed organic vegetables.” And because “cold laser therapy and shots of wheatgrass juice were [not] the cancer treatment of choice among the Iroquois healers of precontact North America” the Globe argued that the issue of Aboriginal right should not apply in this case. As a matter of fact, neither the Globe and Mail or Justice Edward were aware of the specifics of the traditional Indigenous medical practices that were applied along with the visits to the Florida wellness centre, but the use of non-traditional healing modalities were for the Globe enough to cancel out the issue of Aboriginal right. This is similar to the argument of anti-Native activists who suggest that Indigenous people should be forced to give up their treaty rights because they now live with modern technologies that they didn’t have pre-contact. Despite issuing a “clarification” on his ruling that the Aboriginal right to use traditional medicine must be consistent with the “best interests of the child,” Justice Edward’s decision retains its significance and upheld the Haudenosaunee “Aboriginal right” to follow their own path. 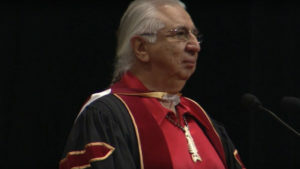 Although as Mohawk lawyer Steve Ford has pointed out, Edward’s “ruling is not binding on any other courts,” his was the first Canadian court ruling to recognize and respect the right of Indigenous children in Canada not to be forced into medical treatment – in a context where for hundreds of years, Indigenous children have suffered medical neglect if not outright abuse from the Canadian state. 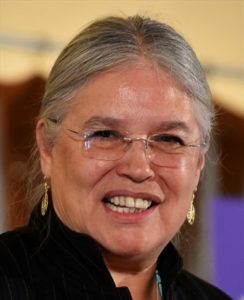 In this case, what in the Canadian system is understood as an “Aboriginal right” that must be respected, is for the Haudenosaunee a much broader recognition of the continuing existence of the principles of the Two Row Wampum – a mutually beneficial relationship between separate but equal partners. 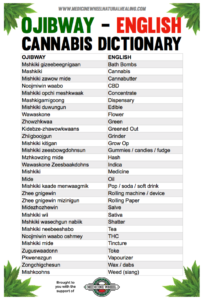 Are Indigenous Medical Cannabis Dispensaries an “Aboriginal Right”? Over the course of the last several years, cannabis dispensaries have begun opening up throughout major cities in Canada. Cities like Vancouver, Toronto and Montreal now have dozens of dispensaries operating openly. 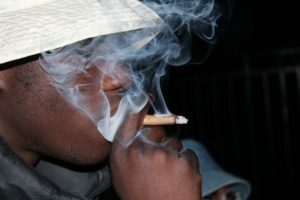 Some have followed the letter of the Canadian law and only accepted clients “authorized to use cannabis for medical purposes by their healthcare practitioner.” Others like the Cannabis Culture dispensaries owned by Marc and Jodie Emery, consider all usage of cannabis to be medicinal, and sell cannabis to any adults seeking access to the plant. 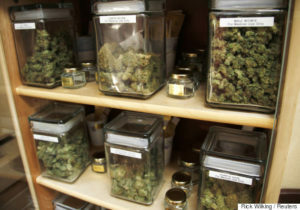 All dispensaries claim positive therapeutic effects from the sale of the cannabis related wares and are enthusiasts of the “cannabis culture” broadly understood. 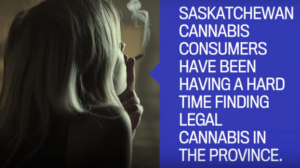 And all of these storefronts have been deemed illegal by “the great legalizer” Justin Trudeau, who has felt “frustrated” by the failure of various Canadian police services to crack down on the dispensaries. Elected band councils in Tyendinaga and Kahnawake are now openly saying that they’re interested in investigating their options in getting into the business as well. 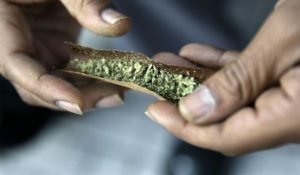 With Indigenous people deeply suspicious of a Canadian medical system which has long mistreated and neglected them, many are turning to cannabis as a “natural” medicine to help with a wide range of health issues including addiction to opioid painkillers and treatment of PTSD. 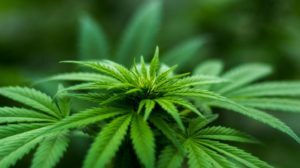 While there is an undeniable economic and political advantage to Indigenous people playing a role in the cannabis industry and staking out their own use of the plant before the anticipated date of Canadian legalization on July 1st, 2018, a more immediate issue concerns the implications of Edward’s ruling for the industry. 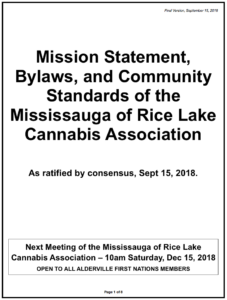 Specifically, does Edward’s ruling recognizing Haudenosaunee medical practices as an “Aboriginal right” provide a legal bulwark that will protect Indigenous cannabis dispensaries from the raids currently targeting non-native dispensaries in major cities in Canada? What defines an “Aboriginal Right”? 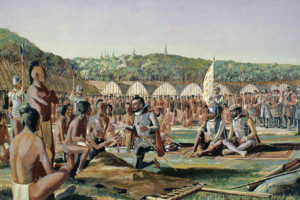 These rights exist as a result of the way in which Canada was created – not through the conquest of Indigenous people, but rather through a series of treaties which gave the subjects of the British Crown the right to establish their country on Native lands. In return, the Crown agreed to uphold and protect the rights that were never relinquished by the treaty signers. It must be stressed that the notion of an “Aboriginal right” is in itself a product of the colonial framework that is so fundamental to Canada itself. What is considered an “Aboriginal right” is being decided by the legal system of a decidedly colonial entity which has systematically carried out cultural and physical genocide against Indigenous people as it sought to appropriate their lands and resources. The Canadian courts have always been an integral part of this system, and have thus been careful to limit and construct the Aboriginal “rights” in question. In his consideration of the question of Aboriginal rights, Judge Edwards relied heavily on the Supreme Court of Canada decision in R. v. Van der Peet 109 CCC (3D) 1. This case concerned Aboriginal fishing rights and arose after an Indigenous Sto:lo woman was charged for selling ten salmon she caught herself. The majority decision in that case was delivered by Chief Justice Antonio Lamer. Therefore the application was dismissed and the Aboriginal rights of J.J. and her family upheld. Despite the significance of Edward’s ruling on Aboriginal rights, the unfortunate reality is that Aboriginal people have no rights that the Canadian system is required to respect. Even though in R. v. Van der Peet Judge Lamer suggested that the rules of evidence should be “relaxed” because of the “evidentiary difficulties in proving a right which originates in times where there were no written records of the practices, customs and traditions engaged in,” his perspective is still firmly colonial. That is because it allows for a very narrow interpretation of an Aboriginal right. As opposed to seeing Aboriginal communities as distinct, self-organized societies that are actively evolving and constantly redefining their traditions and practises, Lamer recognized only such Aboriginal rights that have been frozen in time. In another foundational case on the issue of Aboriginal right – the Mitchell v. Minister of National Revenue case – Chief Michael Mitchell (Kanentakeron) argued that Mohawks had an Aboriginal right to bring goods across the St. Lawrence River / US-Canada border without paying customs duties. In this case, the Supreme Court of Canada ruled that “the government retained the jurisdiction to limit Aboriginal rights for justifiable reasons in the pursuit of substantial and compelling public objectives.” This ruling is worded vaguely enough to mean that any “Aboriginal right” could be overturned by the Canadian system as long as there were “substantial and compelling public objectives” [for Canada] in overturning it. On the surface it would thus seem unlikely that a Canadian court would rule that the establishment of cannabis dispensaries by Indigenous people are protected as an Aboriginal right. The Canadian courts are inescapably colonial institutions, and if they ruled in favour of criminalizing an Indigenous woman seeking to make ends meet by selling ten salmon she caught in her people’s river, they would hardly want to provide a legal justification for a multi-million dollar industry run by Indigenous people that will compete with the “substantial and compelling public objectives” of Canadian corporate control over the plant and its revenue. According to the legal precedents for determining an “Aboriginal right” in the Canadian courts, Aboriginals would have to be able to prove that cannabis was an integral part of their culture pre-contact. 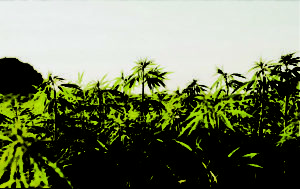 Although the issue is contested, there is evidence of cannabis use in pre-contact Indigenous cultures. 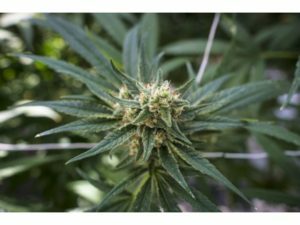 The seeds of the cannabis plant – the “oldest plant cultivated by humans” – could have been brought by bird or human migration across the Bering Strait – as the first traces of cannabis in the historical record identify its existence in Asia. We also know that the Vikings who arrived in North America over 1000 years ago used hemp sails on their boats and travelled with stocks of hemp seed on board so they could grow the plant in their new settlements. The Tuscarora, an Iroquoian people in the Carolinas, were known as the people of the “fancy shirts” or the “people of the hemp shirts” and they extensively used fibres to makes shirts, cordage and textiles. The main plant they used was Apocynum cannabinum or Indian Hemp, which while an excellent source of fibre, has no psychoactive properties and is in fact toxic when consumed. 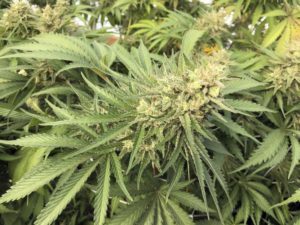 However, as a Tuscarora man working at a Six Nations cannabis dispensary pointed out, there are many different strains of hemp that could be used for different things. Some of the earliest evidence of hemp in North America is associated with the ancient Mound Builders of the Great Lakes and Mississippi Valley. Hundreds of clay pipes, some containing cannabis residue and wrapped in hemp cloth, were found in the so-called Death Mask mound of the Hopewell Mound Builders, who lived about 400 B.C.E in modern Ohio. In his 1891 study, Prehistoric Textile Art of Eastern United States, Smithsonian Institute ethnologist W.H. Holmes describes the recovery of large pieces of hemp fabric at one site in Morgan County, Tennessee: the “friends of the dead deposited with the body not only the fabrics worn during life but a number of skeins of the fiber from which the fabrics were probably made. This fiber has been identified as that of the Cannabis sativa, or wild hemp. The nature of the relationship that Indigenous people will be allowed by Canada to have with the cannabis plant has yet to be determined. The Canadian government of Justin Trudeau appears to be quite determined to hand over the 8 billion dollar black market cannabis industry to their friends in the police, pharmaceutical industry and the Liberal party. These are the people who are heading up the corporations that will be the only “Licensed Producers” of the plant under the promised Liberal legislation. “The more I look into the detailed history of hemp in this country, the more I realize the question again boils down to destroying the economic base of all Indigenous, good people in this world. Long before other nations came to this continent, native peoples had knowledge of this sacred plant, this sacred medicine… Those who understand the power of this plant and the uses of this plant have become potential victims upon the sacrificial altar of multinational corporations… that have vested interests in products that make you sicker, and against a natural plant that will bring you back to health. 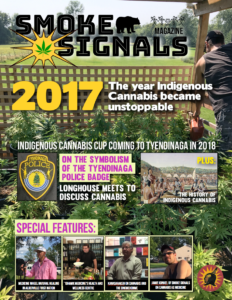 This revival of economic self-dependency based on cannabis is growing fastest in Tyendinaga Mohawk Territory, where multiple dispensaries exist. 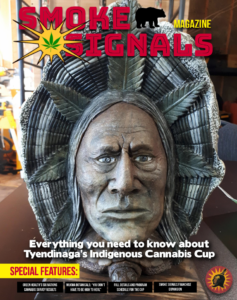 In February of 2017, the Tyendinaga band council expressed its interest and support for existence of medicinal cannabis dispensaries on reserve, providing that they be “regulated.” By the spring of 2017 there were over a dozen different dispensaries open in Tyendinaga. The problem ultimately with the concept of “Aboriginal right” in Canadian law is that it does not allow for the most fundamental and basic right of all nations – the right to self determination. This right implies the ability for a nation to establish a sovereign political representation for itself on its own land base. 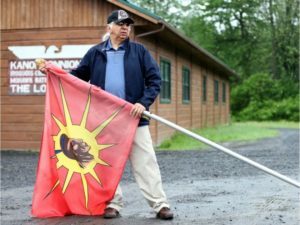 As Mohawk Lawyer Steven Ford points out, even though the right to national self determination is the fundamental basis of international law, it is a right explicitly denied to Indigenous people by the Canadian state. If cannabis dispensaries are not viewed as an Aboriginal right by the Canadian courts, the question is, can and will they be defended by Indigenous political entities? The answer from Mohawk elder Kanasaraken (Loran Thompson) of Akwesasne, recalls the way that Haudenosaunee people have protected their tobacco trade. The perspective that Kanasaraken outlines is one of traditional Indigenous governance systems that pre-dates colonialism, coming forward to protect their economic base and to take back their rights to grow and benefit from plants grown on their lands. 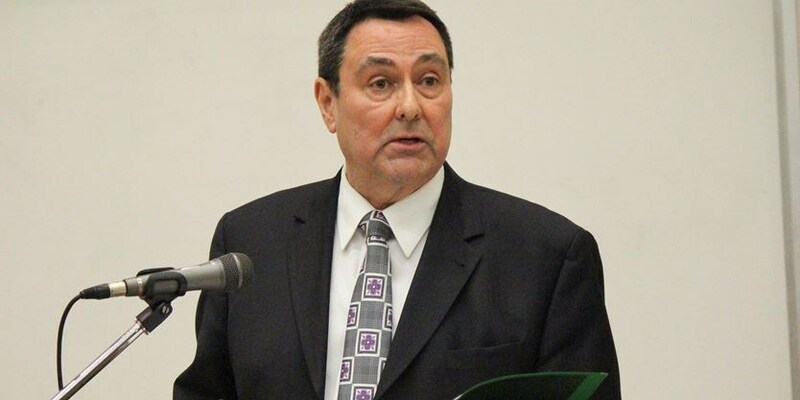 A similar such approach was implemented by the Haudenosaunee Confederacy Chief’s Council in Oswego with their tobacco law aimed at regulating and protecting the Indigenous tobacco industry from Canadian interference. If the courts will not grant “Aboriginal right,” the alternative may just be the daily exercise of sovereignty that is already taking place through the operation of these dispensaries. There is an old saying that “between equal rights, force decides.” Repeated conflicts with state authorities in Caledonia, Tyendinaga, Kanehsatake and Kahnawake have proven that Canadian security forces don’t have the stomach for serious confrontation with Onkwehon:we people. In Caledonia, the OPP were no match for Six Nations, and were driven from the field and defeated on April 20th, 2006. This day constituted the biggest operational defeat in the force’s history and affected how the OPP subsequently dealt with the Idle No More protests of 2012. So the fact that Six Nations residents organized themselves to offer physical protection to the family of Mikayla Sault to ensure that she would not be kidnapped from her home, should not be discounted in the ultimate reasoning that led to Justice Edward’s decision. If Justice Edward, himself a member of the Six Nations, had upheld the request from the hospital to apprehend J.J. there was every likelihood of a major political crisis erupting. From the standpoint of the courts, what is paramount is their continued ability to acknowledged as the ultimate sources of authority and judgement in society. If that means legal frameworks have to be changed, and the rights of increasingly powerful Indigenous actors recognized, than so be it. This is indeed exactly how the legal victories of women’s suffrage, union rights, and civil rights era were won. Mass mobilizations and displays of people’s power convinced the courts to change the laws rather than risk rebellion and ultimately revolution. Legal decisions occur in particular political and social contexts. In times of social transition and political upheaval, decisions that courts make in order to legitimize and maintain the system they belong to can change quickly. 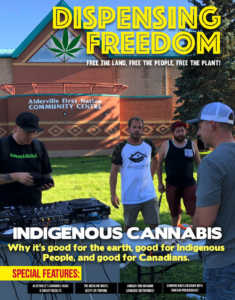 Whether recognized as an Aboriginal right, or protected through daily acts of self determination and the support by Indigenous political institutions, the Indigenous cannabis industry is out of the gates and moving fast. The old days when Canada had full control of Indigenous people on reserves are long gone, and a new “green” economy and a new generation of Indigenous people ready to fight for what is theirs has arrived. 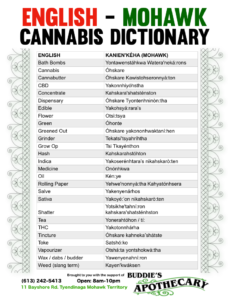 Comments are closed, but <a href="https://dispensingfreedom.com/2018/03/15/cannabis-aboriginal-right/trackback/" title="Trackback URL for this post">trackbacks</a> and pingbacks are open.